SiteZone PWS produces a detection zone around a vehicle, machine or even a restricted area. When the detection zone is breached by personnel wearing a SiteZone transponder (tag) the machine operator is alerted to their presence and can take the appropriate action. 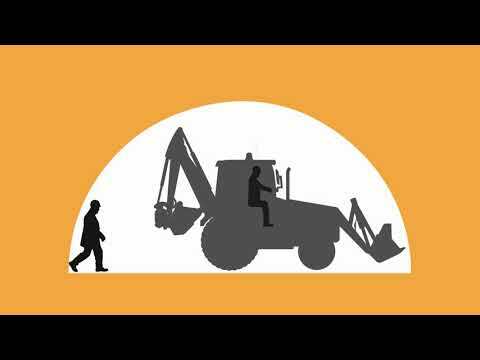 The main function of SiteZone is to warn the machine operator to the presence of tag wearing personnel as he is the only person that can stop the machine. To provide an additional tier of protection there are optional warnings for pedestrians and others. Our base station generates a detection zone or bubble around the vehicle. The size of this bubble can be varied to meet site requirements. The ODU performs a range of functions including alerting the machine operator to zone breaches and controlling authorised approaches. SiteZone Transponders are designed to be an integral part of personnel's PPE. There is no need to recharge or replace batteries in the unit. SiteZone transponders are available in a range of options including a helmet mount vibrating version. Our latest external alarm/beacon combo alerts any tag wearing personnel breaching a safety zone that they have done so allowing them to retreat to a safer location. It also alerts others to the fact there has been an exclusion zone breach. The Oversite system elevates the SiteZone proximity warning system from a site based safety aide to a proactive safety management tool. The SiteZone transponder test station allows uses to easily check that their transponder is working correctly. SiteZone PWS is used across a wide range of industries and applications. To ensure it meets these requirements a range of additional options have been developed. Installed in typically less than 30 minutes the SiteZone EasyFit meets the requirements of the UK building and civil engineering market where most mobile plant is hired as required. BucketZone allows for the creation of a separate detection zone around the working equipment of the machine. This can make the system more practical in certain applications. Useful for plant such as material handlers and loading shovels. Allows two preset ranges to be set on installation. The zone selection is via a supervisor key switch, allowing management controlled zone selection. How do I get SiteZone Proximity Warning System? You can purchase the SiteZone proximity warning system or alternatively the system can be hired through our national hire partner ESS Safeforce. We also offer competitive lease hire arrangements. SiteZone generates an RF field (or bubble) around the vehicle. If the bubble is breached by a transponder wearing pedestrian then SiteZone generates appropriate alarms warning both the vehicle operator and pedestrian. This warning gives time for all parties to take the necessary actions. Multiple and concurrent breaches are recognised and all alarm events are data logged. How easy is it to implement SiteZone on my sites? We use our unparalleled applications knowledge to help our customers successfully implement SiteZone into their site operations. Thousands of installations have been completed to date on a wide range sites. Are the transponders (tags) serviceable? All tags are tamper-proof with no user serviceable parts. The long battery life and rugged construction provides reliable operation and removes the need for rechargeable or replaceable batteries. SiteZone is recommended for use wherever there is a safety concern and incident potential between personnel and vehicles. See the Sectors for more information. What machines can SiteZone be used on? We have deployed SiteZone on vehicles from small forklift trucks all the way up to a 160 tonne crane and every type of mobile plant inbetween. There are simple and effective steps that can be taken to improve the safety of the plant - personnel interface. Think safe site, safe vehicle, safe pedestrians.